This article is about the ancient city. For other uses, see Nimrud (disambiguation). Not to be confused with Birs Nimrud. "Kalhu" redirects here. For the village in Lorestan, Iran, see Kolehu, Lorestan. Nimrud (/nɪmˈruːd/; Arabic: النمرود‎) is an ancient Assyrian city located 30 kilometres (20 mi) south of the city of Mosul, and 5 kilometres (3 mi) south of the village of Selamiyah (Arabic: السلامية‎), in the Nineveh plains in Upper Mesopotamia. It was a major Assyrian city between approximately 1350 BC and 610 BC. The city is located in a strategic position 10 kilometres (6 mi) north of the point that the river Tigris meets its tributary the Great Zab. The city covered an area of 360 hectares (890 acres). The ruins of the city were found within one kilometre (1,100 yd) of the modern-day Assyrian village of Noomanea in Nineveh Province, Iraq. Archaeological excavations at the site began in 1845, and were conducted at intervals between then and 1879, and then from 1949 onwards. Many important pieces were discovered, with most being moved to museums in Iraq and abroad. In 2013, the UK's Arts and Humanities Research Council funded the "Nimrud Project", directed by Eleanor Robson, whose aims were to write the history of the city in ancient and modern times, to identify and record the dispersal history of artefacts from Nimrud, distributed amongst at least 76 museums worldwide (including 36 in the United States and 13 in the United Kingdom). In 2015, the terrorist organization Islamic State of Iraq and the Levant (ISIL) announced its intention to destroy the site because of its "un-Islamic" Assyrian nature. In March 2015, the Iraqi government reported that ISIL had used bulldozers to destroy excavated remains of the city. Several videos released by ISIL showed the work in progress. In November 2016 Iraqi forces retook the site, and later visitors also confirmed extensive destruction. Others have suggested that the damage has been overstated. The Assyrian king Shalmaneser I (1274–1245 BC) built up Kalhu (Nimrod) into a major city during the Middle Assyrian Empire (1365–1050 BC). However, the ancient city of Assur remained the capital of Assyria, as it had been since c. 3500 BC. The city gained fame when king Ashurnasirpal II (883–859 BC) of the Neo-Assyrian Empire (911–605 BC) made it his capital at the expense of Assur. He built a large palace and temples in the city, which had fallen into a degree of disrepair during the Bronze Age Collapse of the mid-11th to mid-10th centuries BC. Thousands of men worked to build an 8-kilometre-long (5 mi) wall surrounding the city and a grand palace. There were many inscriptions carved into limestone including one that said: "The palace of cedar, cypress, juniper, boxwood, mulberry, pistachio wood, and tamarisk, for my royal dwelling and for my lordly pleasure for all time, I founded therein. Beasts of the mountains and of the seas, of white limestone and alabaster I fashioned and set them up on its gates." The inscriptions also described plunder stored at the palace: "Silver, gold, lead, copper and iron, the spoil of my hand from the lands which I had brought under my sway, in great quantities I took and placed therein. The inscriptions also described great feasts he had to celebrate his conquests. However his victims were horrified by his conquests. The text also said: "Many of the captives I have taken and burned in a fire. Many I took alive; from some I cut off their hands to the wrists, from others I cut off their noses, ears and fingers; I put out the eyes of many of the soldiers. I burned their young men, women and children to death." About a conquest in another vanquished city he wrote: "I flayed the nobles as many as rebelled; and [I] spread their skins out on the piles." He wanted the city to become the grandest and luxuriant in the empire. He created a zoo and botanical gardens in the city which also featured exotic animals, trees and flowers he had brought back from his military campaigns. A grand opening ceremony with festivities and an opulent banquet in 879 BC is described in an inscribed stele discovered during archeological excavations. By 800 BC Nimrud had grown to 75,000 inhabitants making it the largest city in the world. 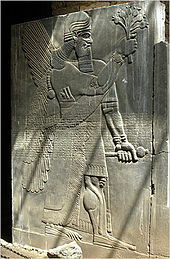 King Ashurnasirpal's son Shalmaneser III (858–823 BC) continued where his father had left off. At Nimrud he built a palace that far surpassed his father's. It was twice the size and it covered an area of about 5 hectares (12 acres) and included more than 200 rooms. He built the monument known as the Great Ziggurat, and an associated temple. Nimrud remained the capital of the Assyrian Empire during the reigns of Shamshi-Adad V (822–811 BC), Adad-nirari III (810–782 BC), Queen Semiramis (810–806 BC), Adad-nirari III (806–782 BC), Shalmaneser IV (782–773 BC), Ashur-dan III (772–755 BC), Ashur-nirari V (754–746 BC), Tiglath-Pileser III (745–727 BC) and Shalmaneser V (726–723 BC). Tiglath-Pileser III in particular, conducted major building works in the city, as well as introducing Eastern Aramaic as the lingua franca of the empire, whose dialects still endure among the Christian Assyrians of the region today. However, in 706 BC Sargon II (722–705 BC) moved the capital of the empire to Dur Sharrukin, and after his death, Sennacherib (705–681 BC) moved it to Nineveh. It remained a major city and a royal residence until the city was largely destroyed during the fall of the Assyrian Empire at the hands of an alliance of former subject peoples, including the Babylonians, Chaldeans, Medes, Persians, Scythians, and Cimmerians (between 616 BC and 599 BC). 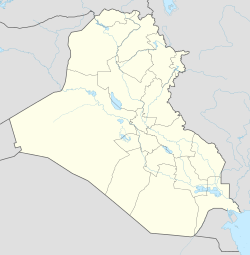 The Nineveh Province, in which the ruins of Nimrud lie, is still the major center of Iraq's indigenous Assyrian population (now exclusively Eastern Aramaic-speaking Christians) to this day. Ruins of a similarly located city named "Larissa" were described by Xenophon in his Anabasis in the 5th century BC. In 1830, traveller James Silk Buckingham wrote of "two heaps called Nimrod-Tuppé and Shah-Tuppé... The Nimrod-Tuppé has a tradition attached to it, of a palace having been built there by Nimrod". However, the name became the cause of significant debate amongst Assyriologists in the mid-nineteenth century, with much of the discussion focusing on the identification of four Biblical cities mentioned in Genesis 10: "From that land he went to Assyria, where he built Nineveh, the city Rehoboth-Ir, Calah and Resen". Initial excavations at Nimrud were conducted by Austen Henry Layard, working from 1845 to 1847 and from 1849 until 1851. Following Layard's departure, the work was handed over to Hormuzd Rassam in 1853-54 and then William Loftus in 1854-55. After George Smith briefly worked the site in 1873 and Rassam returned there from 1877 to 1879, Nimrud was left untouched for almost 60 years. A British School of Archaeology in Iraq team led by Max Mallowan resumed digging at Nimrud in 1949. The work continued until 1963 with David Oates becoming director in 1958 followed by Julian Orchard in 1963. Subsequent work was by the Directorate of Antiquities of the Republic of Iraq (1956, 1959–60, 1969–78 and 1982–92), Janusz Meuzynski (1974–76), Paolo Fiorina (1987–89) with the Centro Ricerche Archeologiche e Scavi di Torino who concentrated mainly on Fort Shalmaneser, and John Curtis (1989). In 1974 to his untimely death in 1976 Janusz Meuszynski, the director of the Polish Center for Mediterranean Archaeology project, with the permission of the Iraqi excavation team, had the whole site documented on film—in slide film and black-and-white print film. Every relief that remained in situ, as well as the fallen, broken pieces that were distributed in the rooms across the site were photographed. Meuszynski also arranged with the architect of his project, Richard P. Sobolewski, to survey the site and record it in plan and in elevation. Excavations revealed remarkable bas-reliefs, ivories, and sculptures. A statue of Ashurnasirpal II was found in an excellent state of preservation, as were colossal winged man-headed lions weighing 10 short tons (9.1 t) to 30 short tons (27 t) each guarding the palace entrance. The large number of inscriptions dealing with king Ashurnasirpal II provide more details about him and his reign than are known for any other ruler of this epoch. The palaces of Ashurnasirpal II, Shalmaneser III, and Tiglath-Pileser III have been located. Portions of the site have been also been identified as temples to Ninurta and Enlil, a building assigned to Nabu, the god of writing and the arts, and as extensive fortifications. Nimrud has been one of the main sources of Assyrian sculpture, including the famous palace reliefs. Layard discovered more than half a dozen pairs of colossal guardian figures guarding palace entrances and doorways. These are lamassu, statues with a male human head, the body of a lion or bull, and wings. They have heads carved in the round, but the body at the side is in relief. They weigh up to 27 tonnes (30 short tons). 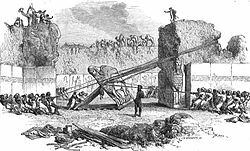 In 1847 Layard brought two of the colossi weighing 9 tonnes (10 short tons) each including one lion and one bull to London. After 18 months and several near disasters he succeeded in bringing them to the British Museum. This involved loading them onto a wheeled cart. They were lowered with a complex system of pulleys and levers operated by dozens of men. The cart was towed by 300 men. He initially tried to hook up the cart to a team of buffalo and have them haul it. However the buffalo refused to move. Then they were loaded onto a barge which required 600 goatskins and sheepskins to keep it afloat. After arriving in London a ramp was built to haul them up the steps and into the museum on rollers. Additional 27-tonne (30-short-ton) colossi were transported to Paris from Khorsabad by Paul Emile Botta in 1853. In 1928 Edward Chiera also transported a 36-tonne (40-short-ton) colossus from Khorsabad to Chicago. The Metropolitan Museum of Art in New York has another pair. The Statue of Ashurnasirpal II, Stela of Shamshi-Adad V and Stela of Ashurnasirpal II are large sculptures with portraits of these monarchs, all secured for the British Museum by Layard and the British archaeologist Hormuzd Rassam. Also in the British Museum is the famous Black Obelisk of Shalmaneser III, discovered by Layard in 1846. This stands six-and-a-half-feet tall and commemorates with inscriptions and 24 relief panels the king's victorious campaigns of 859–824 BC. It is shaped like a temple tower at the top, ending in three steps. Series of the distinctive Assyrian shallow reliefs were removed from the palaces and sections are now found in several museums (see gallery below), in particular the British Museum. These show scenes of hunting, warfare, ritual and processions. The Nimrud Ivories are a large group of ivory carvings, probably mostly originally decorating furniture and other objects, that had been brought to Nimrud from several parts of the ancient Near East, and were in a palace storeroom and other locations. These are mainly in the British Museum and the National Museum of Iraq, as well as other museums. Another storeroom held the Nimrud Bowls, about 120 large bronze bowls or plates, also imported. One panel of the Black Obelisk of Shalmaneser III has an inscription which includes the name mIa-ú-a mar mHu-um-ri-i. Whilst Rawlinson originally translated this in 1850 as "Yahua, son of Hubiri", a year later reverend Edward Hincks, suggested it refers to king Jehu of Israel. Whilst other interpretations exist, the obelisk is widely viewed by biblical archaeologists as therefore including the earliest known dedication of an Israelite. A number of other artifacts considered important to Biblical history were excavated from the site, such as the Nimrud Tablet K.3751 and the Nimrud Slab. The bilingual Assyrian lion weights were important to scholarly deduction of the history of the alphabet. Nimrud's various monuments had faced threats from exposure to the harsh elements of the Iraqi climate. Lack of proper protective roofing meant that the ancient reliefs at the site were susceptible to erosion from wind-blown sand and strong seasonal rains. In mid-2014, the Islamic State of Iraq and the Levant (ISIL) occupied the area surrounding Nimrud. ISIL destroyed other holy sites, including the Mosque of the Prophet Jonah in Mosul. In early 2015, they announced their intention to destroy many ancient artifacts, which they deemed idolatrous or otherwise un-Islamic; they subsequently destroyed thousands of books and manuscripts in Mosul's libraries. In February 2015, ISIL destroyed Akkadian monuments in the Mosul Museum, and on March 5, 2015, Iraq announced that ISIL militants had bulldozed Nimrud and its archaeological site on the basis that they were blasphemous. A member of ISIL filmed the destruction, declaring, "These ruins that are behind me, they are idols and statues that people in the past used to worship instead of Allah. The Prophet Muhammed took down idols with his bare hands when he went into Mecca. We were ordered by our prophet to take down idols and destroy them, and the companions of the prophet did this after this time, when they conquered countries." 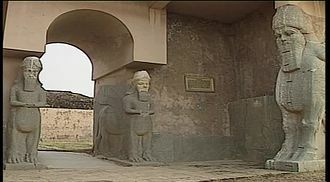 ISIL declared an intention to destroy the restored city gates in Nineveh. ISIL went on to do demolition work at the later Parthian ruined city of Hatra. On April 12 2015, an on-line militant video purportedly showed ISIL militants hammering, bulldozing and ultimately using explosive to blow up parts of Nimrud. Irina Bokova, the director general of UNESCO, stated "deliberate destruction of cultural heritage constitutes a war crime". The president of the Syriac League in Lebanon compared the losses at the site to the destruction of culture by the Mongol Empire. In November 2016, aerial photographs showed the systematic leveling of the Ziggurat by heavy machines. On 13 November 2016, the Iraqi Army recaptured the city from ISIL. The Joint Operations Command stated that it had raised the Iraqi flag above its buildings and also captured the Assyrian village of Numaniya, on the edge of the town. ^ a b Niebuhr wrote on p.355: [in original German]: "Bei Nimrud, einem verfallenen Castell etwa 8 Stunden von Mosul, findet man ein merkwürdigeres Werk. Hier ist von beiden Ufern ein Damm in den Tiger gebaut, um so viel Wasser zurück zu halten, als nöthig ist, die benachbarten Ländereien zu wässern." / [translated]: At Nimrud, a dilapidated castle about 8 hours outside of Mosul, one finds a more remarkable work. Here are both banks of a dam built in the Tigres to hold back as much water as is necessary to water the neighbouring lands." ^ a b c William Francis Ainsworth, who preferred the identification of Resen with Nimrud (on the basis of Bochart's identification of Resen with Xenophon's Larissa), summarised the debate in 1855 as follows: "The learned Bochart first advanced the supposition that this Assyrian city was the same as the primeval city, called Resen in the Bible and that the Greeks having asked its name were answered, Al Resen, the article being prefixed, and from whence they made Larissa, in an easy transposition. I adopted this presumed identity as extremely probable, and Colonel Chesney (ii. 223) has done the same, not as an established fact, but as a presumed identity.... In 1846, Colonel Rawlinson, speaking of Nimrud, noticed it as probably the Rehoboth of Scripture, but he added in a note, "I have no reason for identifying it witli Rehoboth, beyond its evident antiquity, and the attribution of Resen and Calah to other sites. (Journal of Roy. Asiat. Soc. vol. x. p. 26.) At this time Colonel Rawlinson identified Calah with Holwan or Sir Pul-i-Zohab, and Resen, or Dasen, with Yasin Teppeh in the plain of Sharizur in Kurdistan. In 1849 (Journ. of Roy. Asiat. Soc. vol. xi. p. 10), Colonel Rawlinson said, "The Arabic geographers always give the title of Athur to the great ruined capital near the mouth of the Upper Zab. The ruins are now usually known by the name of Nimrud. It would seem highly probable that they represent the Calah of Genesis, for the Samaritan Pentateuch names this city Lachisa, which is evidently the same title as the Λάρισσα of Xenophon, the Persian r being very usually replaced both in Median and Babylonian by a guttural." In 1850 (Journ. of Roy. Asiat. Soc. vol. xii.). Colonel Rawlinson added the discovery of a cuneiform inscription bearing the title Levekh, which he reads Halukh. "Nimrud," says the distinguished palaeographist, "the great treasure-house which has furnished us with all the most remarkable specimens of Assyrian sculpture, although very probably forming one of that group of cities, which in the time of the prophet Jonas, were known by the common name of Nineveh, has no claim, itself, I think, to that particular appellation. The title by which it is designated on the bricks and slabs that form its buildings, I read doubtfully as Levekh, and I suspect this to be the original form of the name which appears as Calah in Genesis, and Halah in Kings and Chronicles, and which indeed, as the capital of Calachene, must needs have occupied some site in the Immediate vicinity." Lastly, in 1853 (Journ. of Roy. Asiat. Soc. vol. xv. p. vi. et seq. ), Colonel Rawlinson describes the remarkable cylinder before alluded to as found at Kilah Shirgat, which establishes that site to have been the most ancient capital of the Assyrian empire, and to have been called Assur as well as Nimrud and Nineveh Proper. This Assur, we have seen, he identifies with the Tel Assur of the Targums, which is used for the Mosaic Resen; and instead, therefore, of Resen being between Nineveh and Calah, It should be Calah, which was between Nineveh and Resen. But, notwithstanding such very high authority, the conclusion thus arrived at does not appear to be perfectly satisfactory." ^ Layard (1849, p.194) noted the following in a footnote: "Yakut, in his geographical work called the Moejem el Buldan, says, under the head of "Athur," "Mosul, before it received its present name, was called Athur, or sometimes Akur, with a kaf. It is said that this was anciently the name of el Jezireh (Mesopotamia), the province being so called from a city, of which the ruins are now to be seen near the gate of Selamiyah, a small town, about eight farsakhs east of Mosul; God, however, knows the truth." The same notice of the ruined city of Athur, or Akur, occurs under the head of "Selamiyah." Abulfeda says, " To the south of Mosul, the lesser (?) Zab flows into the Tigris, near the ruined city of Athur." In Reinaud's edition (vol. i. p. 289, note 11,) there is the following extract from Ibn Said: — " The city of Athur, which is in ruins, is mentioned in the Taurat (Old Testament). There dwelt the Assyrian kings who destroyed Jerusalem."" ^ a b Rich (1836, p.129) described his interpretation as follows: "I was curious to inspect the ruins of Nimrod, which I take to be the Larissa of Xenophon. They were sufficiently visible from the shore to enable me to sketch the principal mount. About a quarter of a mile [400 m] from the west face of the platform is the large village of Nimrod, sometimes called Deraweish. The Turks generally believe this to have been Nimrod's own city; and one or two of the better informed with whom I conversed at Mousul said it was Al Athur or Ashur, from which the whole country was denominated. It is curious that the villagers of Deraweish still consider Nimrod as their founder. The village story-tellers have a book they call the "Kisseh Nimrod," or Tales of Nimrod, with which they entertain the peasants on a winter night. [Footnote: In the name of this obscure place seems to be preserved that of the first settler of the country, and from this spot, perhaps, that name extended over the whole vast region. See Gen. x. 11 . "Out of that land went forth Ashur and builded Nineveh," &c.; or, as it has been rendered, "Out of that land he went forth into Ashur,"i.e. Assyria. The former translation seems the preferable one; and the position of this village is avourable to the supposition of its having received very early a name afterwards to become so celebrated.]" ^ Fletcher (1850, p.75-78) described his thesis as follows: "The Tell of Nimroud and its lately discovered treasures have excited so much interest that I trust I may be pardoned if I interrupt the course of the narrative to bestow a few remarks on the identity of this site with that of the ancient city of Rehoboth, mentioned in Genesis x. 11. It is evident from the sculptures which have been discovered at Nimroud, that these mounds were in ancient days occupied by some large Assyrian city. Major Rawlinson, in his interesting paper on Assyrian Antiquities, quoted in the Athenceum of January 26, 1850, assumes that the ruins of Nimroud represent the old city of Calah, or Halah, while he places Nineveh at Nebbi Yunas. Yet it appears likely that the ancient Calah, or Halah, which was probably the capital of the district of Calachene, must have been nearer to the Kurdish Mountains. Ptolemy mentions the province of Calachene as bounded on the north by the Mountains of Armenia, and on the south by the district of Adiabene. [Ptolemy, lib. vi. cap. i.] Most writers place Ninus, or Nineveh, within the latter province. But if so, Adiabene would include also Nimroud, and, therefore, it is not probable that Halah, or Calah, could have occupied the site indicated by Major Rawlinson. St. Ephraim, himself a learned Syrian and well acquainted with the history and geography of the East, considers Calah to be the modern Hatareh, a large town inhabited chiefly by Yezidees, and situated N.N.W. of Nineveh. [Strabo, lib. 1G, mentions tbe plain in the vicinity of Nineveh, and seems to consider it as not belonging to the province of Adiabene. But his testimony, if taken, would also exclude that city, and the land to the southward of it, from the district of Calachene, as he enumerates that as a distinct part of Assyria immediately afterwards. In the arrangement of the dioceses recorded in Assemani, torn. iii. Athoor and Adiabene seem to be continually connected, while Calachene is spoken of as nearer the mountains.] Between Hatareh and the site of Nineveh we find a village bearing the name of Ras el Ain, which is evidently a corrupted form of the Resen of Genesis. It is worthy of remark that this theory confirms the statement made in Genesis x. 12, where Resen is represented as occupying a midway position between Calah and Nineveh. But assuming Major Rawlinson's hypothesis to be correct, it is clear that there would be no room for a large city between Nebbi Yunas and Nimroud, a distance of, at most, 40 kilometres (25 mi). Nor is it certain that the latter may be considered as the site of the Larissa of Xenophon. A considerable interval must have taken place between the passage of the river Zab by the Ten Thousand and their arrival at the Tigris. It is expressly mentioned that they forded a mountain stream, which seems to have been of some width, soon after they had passed over the Zab. But no vestige of any stream of this kind appears between Nimroud and the Tigris. It is probable, therefore, that the Χαραδρα of Xenophon was the Hazir, or Bumadas, after passing which, the Ten Thousand marched in a north-westerly direction past the modern village of Kermalis to the Tigris. At a short distance from the latter they encountered a ruined city, which Xenophon terms Larissa, and which occupied probably the site of the modern Ras el Ain. The village known by this name is about 19 kilometres (12 mi) from the Tigris, but the ancient city may have been much nearer. [Xenophon Anab. lib. iii. cap. iv.] Both Ptolemy and Ammianus Marcellinus mention a city situated at the mouth of the Zab, on precisely the same site as that occupied by the mounds of Nimroud, which they term Birtha, or Virtha. But Birtha, or Britha, in Chaldee, signifies the same as Rehoboth in Hebrew, namely, wide squares or streets, an identity in name which seems to imply also an identity in locality. It appears likely, therefore, that Nimroud is the same as Rehoboth, which it is said Asshur founded after his departure from the land of Shinar." ^ Layard, Nineveh and its Remains, "That the ruins at Nimroud were within the precincts of Nineveh, if they do not alone mark its site, appears to be proved by Strabo, and by Ptolemy's statement that the city was on the Lycus, corroborated by the tradition preserved by the earliest Arab geographers. Yakut, and others mention the ruins of Athur, near Selamiyah, which gave the name of Assyria to the province; and Ibn Said expressly states, that they were those of the city of the Assyrian kings who destroyed Jerusalem. They are still called, as it has been shown, both Athur and Nimroud. The evidence afforded by the examination of all the known ruins of Assyria, further identifies Nimroud with Nineveh. It would appear from existing monuments, that the city was originally founded on the site now occupied by these mounds. From its immediate vicinity to the place of junction of two large rivers, the Tigris and the Zab, no better position could have been chosen." ^ Mieroop, Marc van de (1997). The Ancient Mesopotamian City. Oxford: Oxford University Press. p. 95. ISBN 9780191588457. ^ a b Brill's Encyclopedia of Islam 1913-36, p.923, "Nimrud": "At the present day the site is known only as Nimrud, which so far as I know first appears in Niebuhr (1778, p. 355, 368). When this, now the usual, name arose is unknown; I consider it to be of modern origin. It should be noted that names like Nimrod, Tell Nimrod, etc. are not found in the geographical nomenclature of Mesopotamia and the Iraq in the middle ages, while they are several times met with at the present day." ^ The Nimrud Project at Oracc.org: Museums worldwide holding material from Nimrud; "Material from Nimrud has been dispersed into museum collections across the world. This page currently lists 76 museums holding Nimrud objects, with links to online information where available. The Nimrud Project welcomes additions and amendments to the list". ^ "Isis destroyed a 3,000-year-old city in minutes". The Independent. 2017-01-06. Retrieved 2017-04-13. 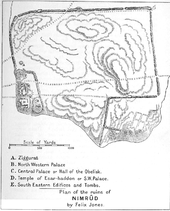 ^ "Old habits die hard: Writing the excavation and dispersal history of Nimrud". tandfonline. 29 May 2017. doi:10.1080/19369816.2017.1328913. ^ "Kalhu". Joshua J. Mark. ^ "The 19 greatest cities in history". ^ Xen. Anab. 3.4.7. The city had been reached after crossing the "Zapatas" river (Xen. Anab. 3.3.6) and then arriving at the Tigris ([Citation URI: http://data.perseus.org/citations/urn:cts:greekLit:tlg0032.tlg006.perseus-eng1:3.4.6 Xen. Anab. 3.4.6]). ^ Buckingham, James Silk (1830). Travels in Assyria, Media, and Persia, Including a Journey from Bagdad by Mount Zagros, to Hamadan, the Ancient Ecbatani, Researches in Ispahan and the Ruins of Persepolis, and Journey from Thence by Shiraz and Shapoor to the Sea-shore; Description of Bussorah, Bushire, Bahrein, Ormuz and Museat: Narrative of an Expedition Against the Pirates of the Persian Gulf, with Illustrations of the Voyage of Nearehus, and Passage by the Arabian Sea to Bombay. H. Colburn. p. 54. Our course now lay nearly east, over a plain, which brought us in half an hour to the two heaps called Nimrod-Tuppé and Shah-Tuppé, between which we passed, without seeing any thing remarkable in them, more than common mounds of earth; though they probably might have shown vestiges of former buildings had they been carefully examined, a task which I could not now step aside from the road to execute. The Nimrod-Tuppé has a tradition attached to it, of a palace having been built there by Nimrod; and the Shah-Tuppé is said by some to have been a pleasure-house; by others, to be the grave of an Eastern monarch, coming on a pilgrimage to Mecca from India, who, being pleased with the beauty of the situation, halted here to take up his abode, and ended his days on the spot. ^ "Ancient Assyrian Treasures Found Intact in Baghdad". National Geographic. Retrieved 6 March 2015. ^ Jane Arraf (February 11, 2009). "Iraq: No Haven for Ancient World's Landmarks". The Christian Science Monitor. ^ "Isis destroys thousands of books and manuscripts in Mosul libraries". The Guardian. 26 Feb 2015. ^ Karim Abou Merhi (March 5, 2015). "IS 'bulldozed' ancient Assyrian city of Nimrud, Iraq says". AFP. Retrieved March 5, 2015. ^ a b "Iraq: Isis militants pledge to destroy remaining archaeological treasures in Nimrud". The Independent. 27 Feb 2015. ^ Morgan Winsor (5 March 2015). "ISIS Destroys Iraqi Archaeological Site Of Nimrud Near Mosul". IBT. Retrieved 8 March 2015. ^ "Isis militants continue path of destruction in Hatra by 'demolishing 2,000 year-old ruins'". The Independent. 7 March 2015. ^ "Islamic State 'demolishes' ancient Hatra site in Iraq". BBC. 7 March 2015. ^ "Islamic State video 'shows destruction of Nimrud'". BBC. 7 March 2015. Retrieved 13 April 2015. ^ "Isis 'bulldozes' Nimrud: UNESCO condemns destruction of ancient Assyrian site as a 'war crime'". The Independent. 6 Mar 2015. ^ Kareem Shaheen (7 March 2015). "Outcry over Isis destruction of ancient Assyrian site of Nimrud". The Guardian. ^ "Iconic Ancient Sites Ravaged in ISIS's Last Stand in Iraq. National geographic 10 november 2016". ^ "Iraqi forces retake historical town of Nimrud". The Telegraph. 13 November 2016. Retrieved 13 November 2016. Crawford, Vaughn E.; et al. (1980). Assyrian reliefs and ivories in the Metropolitan Museum of Art: palace reliefs of Assurnasirpal II and ivory carvings from Nimrud. New York: The Metropolitan Museum of Art. ISBN 978-0870992605. Wikimedia Commons has media related to Nimrud. Wikisource has the text of the 1911 Encyclopædia Britannica article Calah.